Atiku-Tinubu Re-Union For 2019, Goodbye Buhari. The duo have been friends for decades and are not willing to be separated by political affiliations. It’s a good lesson for some of us who feel that loyalty is all about detachment from your pals and family members of different political idiology. 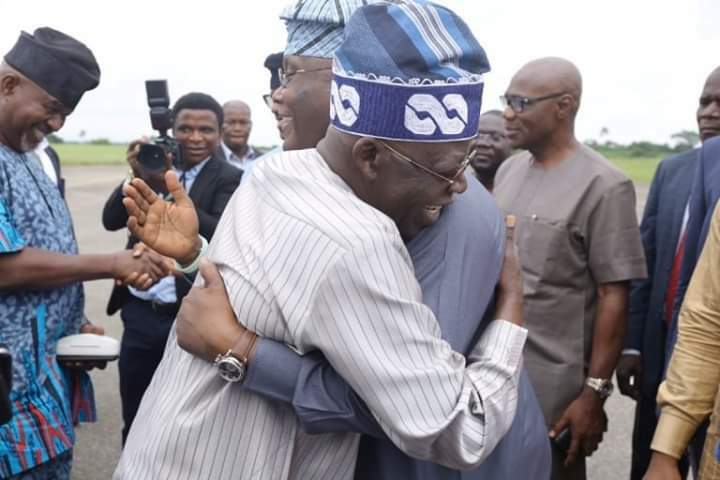 Tinubu referred to Atiku as “The Big Political Masquarade” while exchanging pleasantries with the Waziri Adamawa and 2019 PDP presidential candidate at the Akure airport. It was learnt from reliable sources that Tinubu may form secret electioneering alliance with Atiku, to pay back President Buhari for locking him out of the corridors of power for almost three years of this administration; only to bring him closer recently for the sake of 2019 general elections, particularly the presidential election. Tinubu otherwise known as the JAGABAN of South-West politics cannot be fooled by the Buharists who rusticated him from Aso Rock for such a long time until his wife, Senator Oluremi Tinubu cried out with a loud voice saying “Buhari used and dumped” my husband. A source close to the Jagaban said Tinubu may soon seal a top deal with Atiku to serve as the last straw that shall break the camels back, few weeks to Presidential election in 2019. The duo during their encouter at the airport, it was alleged, promised to see more frequently to redfine leadership structure. Tinubu is particularly interested in Atiku’s restructuring agenda which was dropped by President Muhammadu Buhari thereby reneging on his 2015 campaign promise to restructure Nigeria. It was further learnt that the Asiwaju of Lagos, is not happy with President Buhari, for betraying the party leadership when he made unexpected U-turn and abandoned the restructuring plan which was why the Yoruba people of the South-West voted for APC/BUHARI in 2015. It seems that the South-West voting pattern in 2019, shall spring pleasant surprises as Atiku and Tinubu unite to actualise the restructuring of Nigeria. 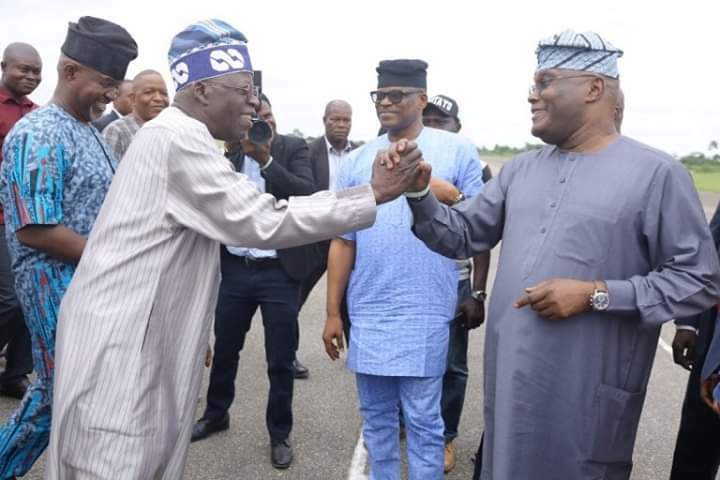 The Asiwaju rightly referred to Atiku as the 2019 big political masquarade, thereby sending positive signals for the endorsement of Atiku as the best 2019 presidential candidate. Whether Buhari and the Buharists like it or not, the table is turning against him and his cabal who swore to run Nigeria as a family business as can be seen from the one-sided appointments in favour of Buhari’s kinsmen. Atiku is the man, PDP is the party. Previous An Open Letter To Nnamdi Kanu. Next SPEECH DELIVERED BY THE FOUNDING NATIONAL CHAIRMAN OF APC, CHIEF BISI AKANDE, AT THE 2ND ANNUAL CONVENTION OF APC USA.